« The relaunched Abu Dhabi Classics concert season has struck a chord regionally and internationally with tickets for the curtain raising opener selling out within a week of release. 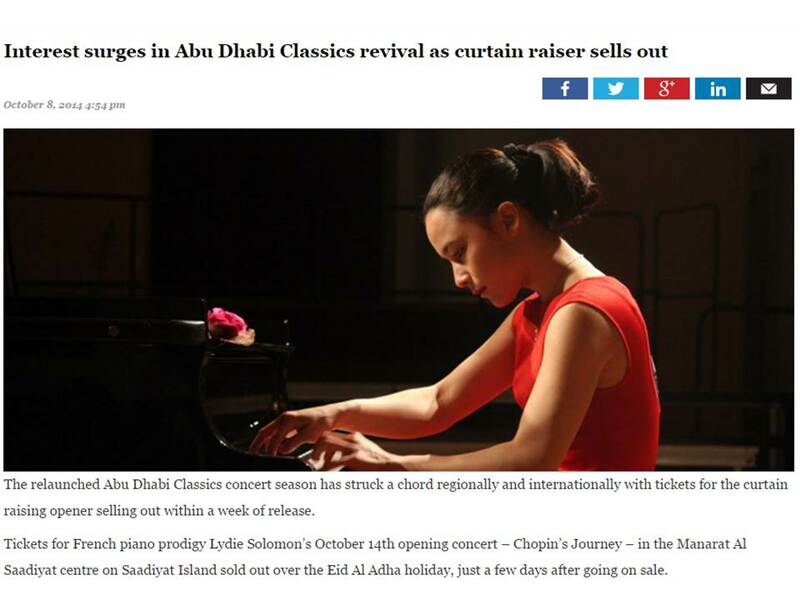 Tickets for French piano prodigy Lydie Solomon's October 14th opening concert – Chopin's Journey – in the Manarat Al Saadiyat centre on Saadiyat Island sold out over the Eid Al Adha holiday, just a few days after going on sale. Tickets for the ‘Four Seasons', by world-renowned violinist Gidon Kremer and the Kremerata Baltica chamber orchestra, at Abu Dhabi Theatre on October 28, and the world premiere of a new concert by Spanish composer Jordi Savall at the Emirates Palace Auditorium on November 20 are also selling extremely well.